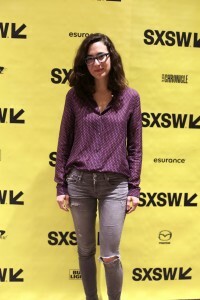 I met with director Laura Terruso on Saturday, March 11, 2017, at SXSW, to discuss her new film, a gently clever comedy entitled Fits and Starts, which I also reviewed. The movie follows the misadventures of married couple David and Jennifer, both writers, who find themselves competing for attention in the cutthroat world of artistic achievement. Wyatt Cenac (The Daily Show), as David, and Greta Lee (Chance), as Jennifer, are both delightful in their parts. Though this is only her first feature as director, Terruso has already earned recognition as the co-writer of Hello, My Name Is Doris, which was based on a short film she had previously made. Here is a condensed digest of our conversation. Hammer to Nail: So, in the end credits of your film, it says that it was made at New York University’s Tisch School of the Arts. Were you still a student when it was made? Is this your thesis film? HtN: (laughs) Are you required to put that at the end of the film, then? Did you actually make it using any of their facilities? Or were you just a student? LT: We used equipment, which was great. We got a lot of equipment, editing facilities, a couple of grants that were really helpful. So yeah, NYU was very integral to the making of this film. HtN: OK, so it’s not just a slogan at the end. It actually happened. LT: And a lot of our crew is NYU. One of my producers, Margherita Arco, was one of my classmates, and my DP [director of photography], Ben Rutkowski, was in the same class as me, as well, and my production designer, Katrina Whalen. We all came up together. 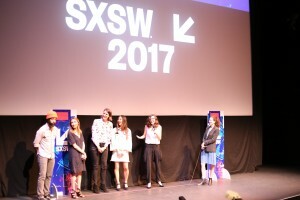 Cast and filmmakers of FITS AND STARTS at their 2017 SXSW Premiere. 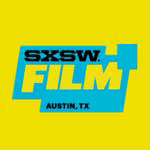 HtN: So your big break came when your short film, Doris and the Intern, was adapted as the feature film Hello, My Name Is Doris, directed by Michael Showalter. You two collaborated on the script for that. How did that collaboration come about? HtN: And anyone who says that has clearly never watched a film by Billy Wilder. LT: Yes! I’m a huge Billy Wilder fan! I think comedy and satire are actually two incredible ways of shedding light on the human experience and enacting change. But anyway … so there were very few comedy people at NYU, and Michael was one of them! So I was in the editing labs working on my second short film in film school. It was a short comedy that I shot over a weekend on the [Panasonic] HVX-200, called Doris and the Intern, and I was in the editing lab and I saw Michael and I was like, “You! You’re funny! Will you watch my short?” And he was like, “Sure!” And he sat and watched it, and he laughed and he loved it, and then we just started chatting. And then we would meet in the student lounge and talk about our favorite filmmakers. We both loved Hal Ashby, and we both had similar sensibilities. It was clear. And one day, he said, “I would love to write something with you.” And I was like (makes happy sound), “Yes, please!” (laughs). Michael Showalter wants to write something with you? Amazing! And so, a couple of weeks later, I went to his office, and I pitched him this idea, and he said, “Let’s do it!” And that was how it happened. I think we both sensed a commonality, in terms of our voices and the way we see the world. HtN: Now you had done other things before going to the NYU Grad Film program, right? You had a background in comedy. LT: Yeah, I got my start in downtown performance art in New York. I was doing weird performance art, which is essentially an alt-comedy scene. And so, it was comedy of a sort. (laughs) It’s like comedy for smart people. (laughs) And so that was how I got my start, and I started making short films, and went to film school, and while I was there … you know, going to film school is a huge gamble. It’s expensive, and it’s saying, “I’m all in.” It’s a scary thing to do and so, for me, it was important that – because I was doing this thing – that I really be all in. And so while I was in film school, I said yes to everything. I worked really hard, and I learned the craft. I did every single role on a set: I worked as a producer; I worked as an AD [assistant director]; I worked as a DP [director of photography]; I worked as a sound recordist. I wanted to learn the craft from top to bottom, so that if I need to “Joe Swanberg” a film, and make a film with me and a couple of friends and a DSLR, I could. And so, in saying yes for years and years, I was able to meet and work with an incredible group of people. I really got to know the indie-film community in New York and got to work with people like Alex Karpovsky; Ben Sinclair and Katja Blichfeld, of HBO’s High Maintenance; I got to meet Onur Tukel. All these faces that you see in the film that are like a who’s who of New York indie film, it’s because I worked in indie film for so long and was able to make connections and meet all these incredible performers and personalities that, in constructing this ensemble, I knew I could pull from. It’s like conducting an orchestra. HtN: Speaking of the people who were in your film and helped you make it, what about the principal and main supporting cast? In terms of the latter, I particularly like Maria Dizzia as the crazy agent. She’s really funny here. But I also really like how you put an interracial couple – an African-American man and an Asian woman – at the center of the story, without ever discussing race. It’s just there. Did you write the story that way, or was it in the casting that you said, well, why not? LT: I didn’t write the story that way, but I sort of see casting and directing as an extension of the writing process. It’s a continuation of the same. You’re shaping the story. And as this character of David emerged on the page, I kept thinking about Wyatt. I had seen him in Barry Jenkins’ film Medicine for Melancholy, which I loved, and I thought his performance in it was really beautiful, because I know he’s an incredibly funny person – he’s a humorist and we see the world in the same way – but he’s also an extremely truthful performer. You don’t see him acting; he just is the guy. And he exudes a kind of soulfulness and depth and intelligence that I knew the character of David really needed. And so, as the character emerged, I was like, this would be great for Wyatt Cenac. I had no idea if he would do it. I didn’t know him personally. I knew he was in New York. So we sent him the script and I met with him. He doesn’t do many indie films, but he said yes. And it was a really fantastic experience working with him on it. And I had worked with Greta on High Maintenance – I shot the original “Homeless Heidi” episode – and was such an admirer of her and her talent and her comedy. I just cast the best actors that I could find for the role. We knew it would make the film better with them in those roles. HtN: And they’re very natural, as performers, so it works well. Did you really shave off Wyatt’s beard? LT: We did. And not only that, he had to keep it half-shaven for a full weekend (laughs) no, not for a full weekend, it was just one night, because we were shooting another scene the next day, where he had to be half-shaven, and so he had to spend a night…he said it was the most uncomfortable night of his life. He had to go to the bodega for something, and he’s got half a beard, and he had to deal with being half-bearded for a night in New York. And it was so funny, because he knew it was coming, but then on the day we had to do it, he was really not happy about it. (laughs) He really didn’t want to have to do it. HtN: And you shot over 14 days, is that right? HtN: So I assume that you shot everything where he had a beard – got that out of the way – and then did the flashbacks later. Once you’d gotten the half-beard, you then moved backwards. HtN: (laughs) Indeed. So, final question: what led you to the development of this particular story? There’s an interaction between a professor and a student, and you had had an interaction with a mentor…I’m not going to assume it was romantic…but what led to the development of this story? LT: The story is very personal for me. All my writing is very personal. Every character that I have created is an extension of myself, in one way or another. I was really interested in looking at a creative couple, and the kinds of relationship dynamics that emerge when two people in the relationship are pursuing the same dream and the same sort of individualistic goal. I think art is very individualistic. And when one person is having more success than another, it’s hard. Being an artist is all about rejection, and so that was something that was really on my mind at the time. And also, I was thinking a lot, then, about the creative process and the tension between the creative process and the business of art. You know, Doris was the first feature-length screenplay that I had ever written, but it was also the first film that I worked on that had commercial aspirations, and was a commercial success. I see my work as being very commercial and commercially viable. HtN: And there’s nothing wrong with that. LT: Exactly! I agree. I don’t think there’s anything wrong with that. HtN: There’s only something with that if that is your sole goal. If you’re working from that as an endpoint, it could irredeemably alter the choices you make. HtN: There’s no shame in being successful. But at the same time, I wouldn’t want to be a filmmaker for whom that was the only goal. LT: I’m so with you. I think that’s exactly right. It’s funny, I moved this year from New York to L.A. (laughs) and in L.A., it’s all about the business, and I’ve been thinking a lot about why the work that comes out of L.A., for the most part, feels very thin, whereas the work in New York is rich. And it’s because in L.A., people are there because they want to make a living. They’re making the art to make money. And in New York, people make work because they have something to say, and they want to shed light on the human condition. Not to say that there aren’t people in L.A. doing that. There are. There are many people doing that. But I think there’s a perversion of art that happens when people make work with an intention. I think there’s a mystery to the creative process and to the process of writing, where you sit down and you don’t know what’s going to emerge, and maybe it’s going to be super commercial, and maybe it’s not. But as long as it’s truthful…and that’s the thing about Fits and Starts, and what David’s character comes to, at the end of the film, is that as long as he is able to speak his truth and let his voice be heard, that’s all that matters. And so it’s a really personal film. HtN: Well, now that you’ve alienated all your potential future colleagues in L.A., I think that’s a good place to end the interview. HtN: (laughs) And thank you! Congrats on the film!